The most beautiful room on the tour. Caver boys enjoying exploring and getting dirty. Beautiful formations and flowstone surrounds you. Spend as much time in each room as you want. This tour is perfect for taking photos. Water droplets all around you. If you get "Kissed" by a drop of water it is said to bring good luck. You can see and hear the caves activity. Even though it is not accessible to the public, this room is to beautiful not to show! A pool of water with a band of Calcite crystal growing all around it. Cave Temperature- 72F/22C and 98% humidity. (Feels like 85F/29C) We are a WARM cave. No need for sweaters or jackets! Stair Steps-Approximately 360 We recommend wearing a comfortable walking shoe. 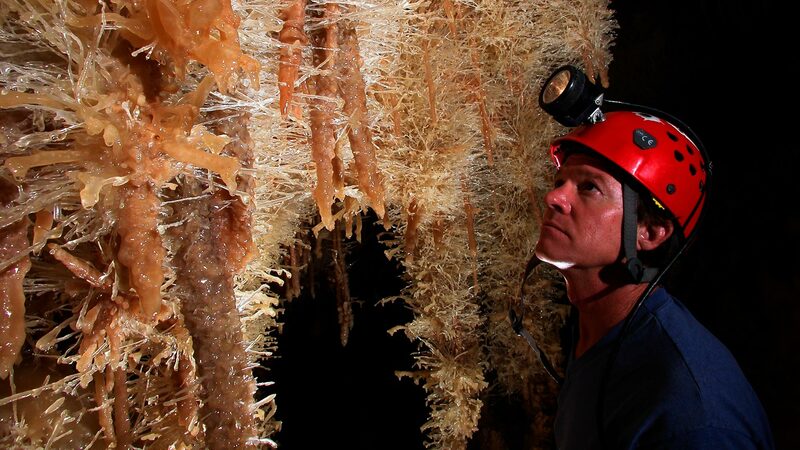 Since we are a formation rich cave, please know that speleothems are very close to and even overhang into the walking trails. 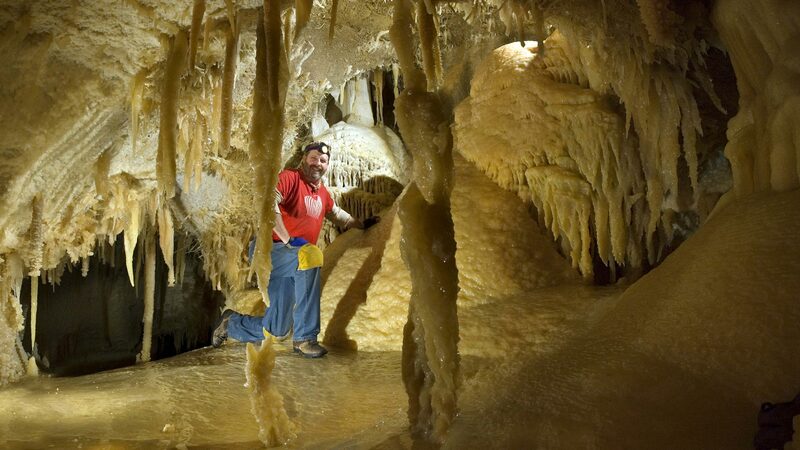 We require your help in protecting the cave by taking NOTHING inside other than your camera. All camera bags, purses, backpacks and fanny packs are not permitted inside the cave. Food, drinks, gum, and tobacco products are prohibited. Due to the sensitive nature of this cave, animals are not allowed into the cave system but we do provide free, onsite kennels. An intimate and expertly guided walking tour, of 12 people or less, through almost two miles of highly decorated cave passages. The tour takes approximately 1 hour and 45 minutes and leaves from the gift shop. There are 360 stair steps and you go to a depth of 155 ft. below the surface. 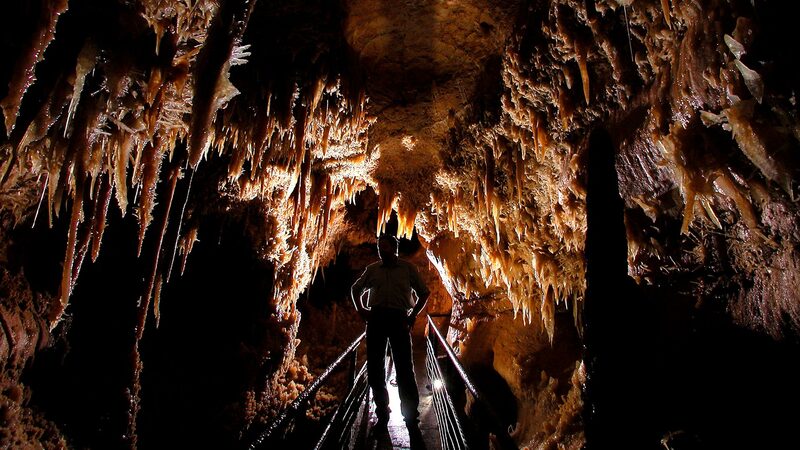 Specialty, School, and large groups are invited to view the cave with advanced reservations. We offer group pricing and tax exempt rates where applicable. Groups can customize their visit by selecting to participate in either the Crystal Palace Tour, or, a condensed tour that lasts approximately 1 hour. 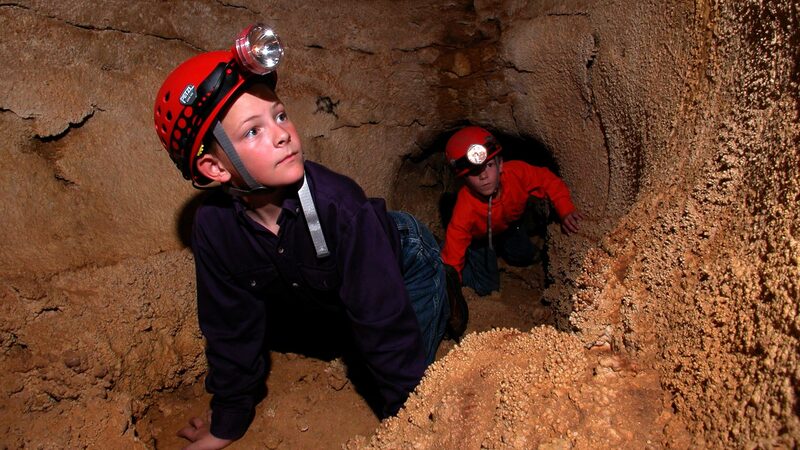 We suggest adding the UNDERGROUND CLASSROOM and GEMSTONE PANNING to your group activities. Perfect for children ages K- 6th. The Underground Classroom is where kid friendly geology, cave biology, and Paleontology collide. Play in the dirt digging for fossils and view a slideshow, inside a cave! Then, wet your hands panning for real gemstones and fossils in our shaded, outdoor sluice! Looking for lunch for your group? Let our local Sonic provide it at a discounted rate. THE FOLLOWING TOURS REQUIRE ADVANCED BOOKING. Feeling a little adventurous? The DISCOVERY CHALLENGE is an unforgettable caving adventure led by an experienced caver through a maze of off trail passageways. Rappel fifty feet into the Devil’s Pit and experience firsthand the thrill of navigating the cave like real cavers. We provide all equipment necessary. The Discovery Challenge takes approximately 4 hours. Minimum tour size is 2 and maximum tour size is 6. This tour is ideal fun for families, couples, and is a great team building experience for small groups. Photography lovers can zoom in on that tiny, mineral rich, water droplet, capture rare, clear crystal helictites, and focus their cameras where ever their eye leads them. 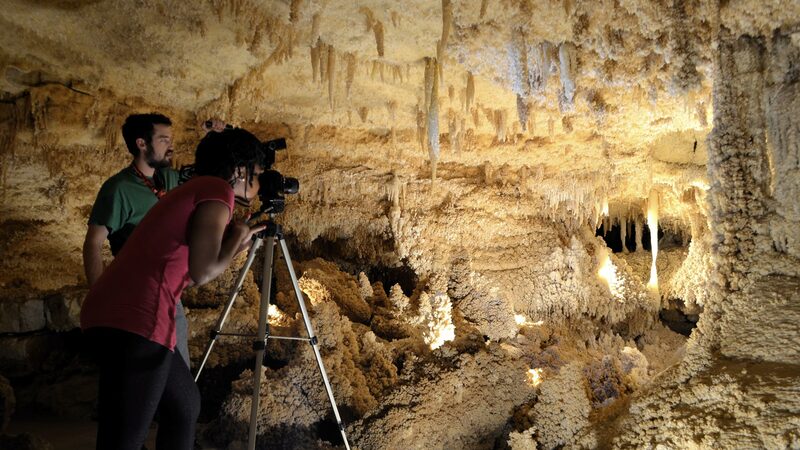 Our PHOTOGRAPHY TOUR is a dream photography session allowing photographers guided access to trails in an unhurried photo walk through one of the most beautiful caves in the world. Photographers may carefully bring a tripod. Ideal for the novice and the pro! 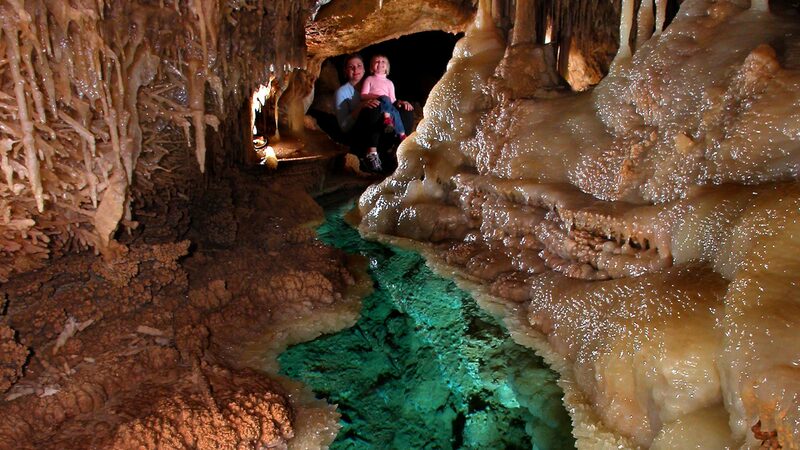 Check out what other travelers say about Caverns of Sonora on TripAdvisor. Copyright © 2015 | Caverns of Sonora | All Rights Reserved.